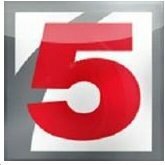 News TV Channel / KSDK, virtual channel 5 (UHF digital channel 35), is an NBC-affiliated television station located in St. Louis, Missouri, United States. The station is owned by the Gannett Company. KSDK maintains studio facilities and offices located on Market Street in Downtown St. Louis, and its transmitter is located in Shrewsbury.